Paddle-sailing is a recreational activity like few others. Combining the propulsion of paddle and sail enables us to go further faster, accessing previously inaccessible waters, while enjoying two sports at once! Modern sailboats are very efficient at harnessing the energy of the wind, but one of the frustrating aspects of a sail-only craft is that when the wind dies, so does the vessel’s speed. Luckily as paddle-sailors, when the wind lessens, we can simply start paddling. Exercise is of course a good thing, but efficiency and technique definitely have their advantages. Less fatigue, greater distances traveled, and higher sustained speeds are just a few of them. Before we get into all the tips, it should be noted that there are no rules here. Ultimately, paddle-sailing should be about enjoying the wind and the water. If your boating goal is simply to relax – maybe do some quiet birdwatching and meander around a small body of water – the following may not be so useful. But If you want to improve your paddle-sailing skills, the following tips might help. As a preface, it’s important to understand a little bit about a boat’s inertia and momentum and about the forces that move a boat and slow it down. At the risk of triggering Physics 101 flashbacks, inertia is a term which refers to how easy or difficult it is to change the speed or direction of an object. Once that object is moving, its momentum determines the amount of friction force required to slow down and come to a stop. Also, it helps to know that applying a force to an object will move it, and that the force of friction will act to slow it down. Weight plays an important role. Heavy (high inertia) objects require more force to be applied to them to speed up and slow down. For example, a super heavy vessel like an oil tanker requires an amazing amount of force and time to get up to speed, as well as to slow down. Modern large ships may require as much as five miles to stop, even with their engines in full reverse! Wow, think about that for a moment. Lightweight (low inertia) objects can speed up and slow down quickly and easily. Have you ever seen an Olympic canoe event, or a world class rowing race? These boats are so light, and the paddlers/rowers so strong, that the boats jolt forward with each stroke. They visually slow down each time the paddle leaves the water, making them have a pulsing “go-slow-go” motion that not only looks bizarre but can make for some pretty exciting finish line action! Since kayaks are some of the lightest production boats around, they have relatively low inertia and slow down quickly, easily succumbing to the frictional drag created from interaction with the water, as well as from the air when sailing upwind. As a side note, there is a common misconception out there that lightweight boats have a faster overall speed compared with equally shaped heavier boats. While it’s true that a lightweight boat will require less force and physical energy to build speed and momentum, heavier boats tend to hold their momentum better, allowing them to cut through the chop and maintain their speed better. The reality is that a kayak’s top end speed (or hull speed) is ultimately dictated by the boat’s waterline length, underwater shape, and total wetted surface area, not by its weight. So what does any of this have to do with paddle-sailing technique? By knowing how an object (in this case our kayak) behaves, we can better understand what we can do to efficiently move it through the water. Tip #1. When that wind puff that was moving your kayak so nicely through the water suddenly goes away, it makes sense to start paddling before the boat slows and loses momentum. A kayak (like any object) requires more energy to accelerate it than to maintain its speed. This is one of the reasons why cars use more fuel when city driving compared with highway driving. In order to conserve energy it makes sense to provide the boat with nearly constant propulsion forces and not let it slow down too much. Tip #2. Use your paddle and the sail together to build momentum to reach a cruising speed, then let the sail take over to help maintain that speed. This not only reduces the time required to get up to cruising speed, but helps with the efficiency of the sail(s) by generating “apparent wind” (the moving air created by the boat moving forward), and this additional wind can help the sails move the boat. 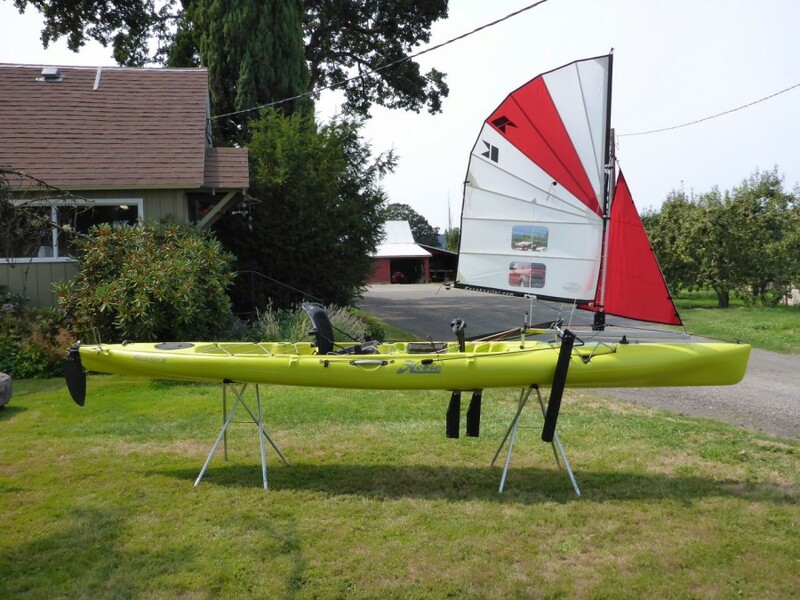 Since a kayak without outriggers has a relatively slender form, it lacks the stability needed to take a large sail plan and must therefore rely on smaller sails to get the job done. This means that anything the paddle-sailor can do to increase the sail’s efficiency will be beneficial. Tip #3. Try to keep the boat relatively flat in the water when paddle-sailing. A flat (non-heeling) boat is easier to paddle with a double bladed paddle. In addition, having a flat boat positions the sails so they remain perpendicular to the wind flow. 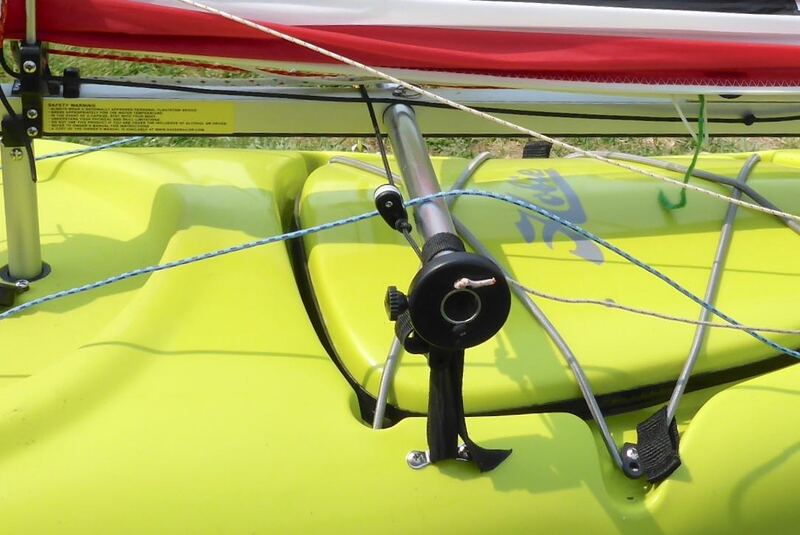 This allows the sail’s foil (wing-like shape) to more efficiently produce lift, and this lifting force is what pulls the boat forward through the water. Tip #4. Unless you are surfing wind swells and chop (sailing downwind), flat water will allow you to sail faster. “Choppy” water has a surface composed of lots of small rough waves. Wind swells are larger waves spaced farther apart. Cutting through chop and swell reduces the boat’s speed and therefore its momentum. Every time the bow plunges through a wave, the part of the bow that was previously above the waterline is now creating frictional drag in the water, slowing you down. For fast and efficient upwind sailing, it’s best to look for flat water. That said, downwind wave surfing can produce some of the fastest speeds in a kayak. This is mainly due to the effect of harnessing the energy and speed of the forward moving wave which is then added to the boat’s forward speed. Tip #5. The best wind speed for sailing upwind is less than fifteen knots (small or no whitecaps present). And the ideal wind speed for windward sailing is probably somewhere between ten and twelve knots (just before whitecaps develop). The reason is twofold. First, friction created by our bodies, the boat, and the rig in the wind, slows upwind progress. Second, the waves slow the boat down and kill momentum. While we did what we could in the rig’s design to reduce its frictional profile in the wind, when it comes to our body size there is little we can do to (except maybe go on a diet). Basically, when we hold an upwind course we are required to fight against both the wind and sea. Even though the Kayaksailor’s sail shape is efficient at generating pulling force, its small size limits how much it can do. In strong winds of over 20 knots (large, frequent white caps are present), paddling while sailing with the leeboards in their full down position is usually the best way to maintain cruising speeds to windward. Tip #6. Lean your torso out to windward to compensate for heeling, instead of bracing with your paddle to leeward. Normally a kayaker will brace with their paddle, essentially pushing it against the water’s surface, to prevent the boat from capsizing. While this works fine for downwind sailing when the boat isn’t heeling (leaning over), it doesn’t work so well on a beam or close reach when the side force of the wind causes the boat to heel. The reason has to do with the position of the sailor’s torso when bracing. The weight of one’s torso is used as a counterbalance to offset the heeling forces of the sail, and, leaning one’s torso to windward is one of the best ways to prevent capsizing. That said, at some point one’s torso weight may not be sufficient to prevent further heeling. This is the time when un-cleating and easing the mainsheet is needed to spill power from the sail and allow the torso to be a more productive counter balance. You might ask, Why not ease the mainsheet in the first place? While this is an option, leaning one’s body out to windward will preserve the pulling power in the sail, resulting in faster boat speeds. 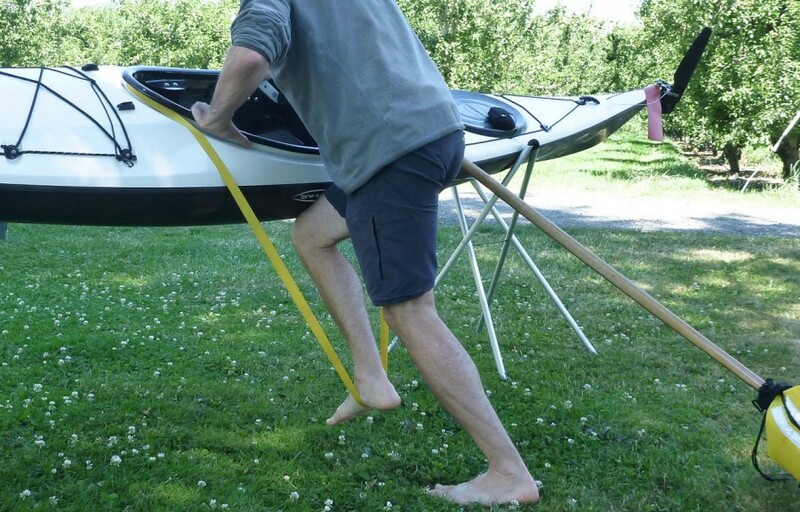 The reason we don’t want to paddle-brace to leeward is that our torso weight moves in the wrong direction, essentially helping the sail heel the boat over. Doing this results in an awkward situation where the paddle-brace becomes ineffective. It also slows the boat due to the paddle blade’s friction in the water. In short, save paddle-bracing for those exciting downwind legs. Tip #7. Try a series of broad reaches instead of a run. 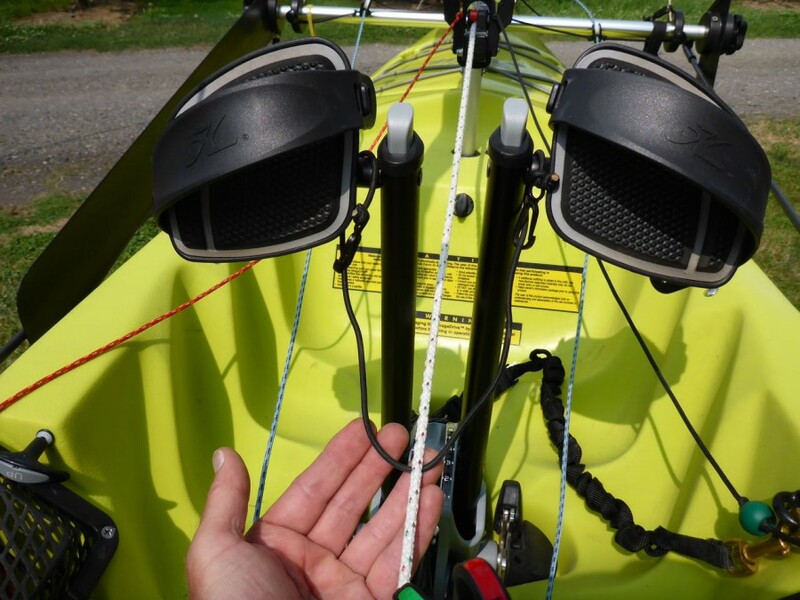 Just like many catamarans, the Kayaksailor rig doesn’t have a backstay. Instead, the shrouds (side stays) are positioned aft of the mast not only to give the mast aft support, but to provide the forestay adequate tension to allow the leading edge of the genoa to have the correct shape. The aft shroud placement creates a situation where, on a direct downwind leg, or “run,” the lower part of the mainsail will rest up against the leeward shroud and lose its curved shape. Also, the sail can’t be completely let out perpendicular to the wind, which is the most efficient sail position for running. Like for catamarans, the answer is to angle off slightly from a directly downwind run, onto a deep broad reach, and sheet in the main so that it is just brushing the shroud. This will allow better boat speeds, not only because of the better sail shape, but because the leeboards will now be engaged. The resistance of the leeboards to move sideways in the water, and the sideways pulling force of the sail work in conjunction with each other to move the boat forward. This forward speed makes apparent wind, which allows the sails to interact with more total wind, generating more pulling power, leading to even faster speeds. The genoa also works better when it is not completely blanketed by the main, as it is on a run. Of course sailing a series of broad reaches means more jibing, so having your jibes down will be important. If you haven’t read it yet, here is a blog post I wrote on jibing technique. Tip #8. When reefing out on the water, point the bow downwind. When shaking out the reef, point the bow upwind. Most sailboat sailors will point their boats directly into the wind to “reef” (make the sail smaller). With the Kayaksailor, it’s usually easier to reef with the bow pointed directly downwind. The reason is that since the kayak is a low inertia boat, when pointing it into the wind, the forward speed will quickly decrease to a stop, and the bow will naturally turn off the wind. This allows the sail to power up and become unmanageable before the reefing knots can be tied. This powered up situation can be frustrating, and a little scary too. Holding a powered up sail in a strong wind is a good way to capsize. By pointing the bow directly downwind, one’s body will block the wind from the now smaller sail, making it relatively easy to grab the boom and gather the sail together. This downwind position also allows more time to tie the quick release knots in the reefing lines. Just be aware that while pointing downwind the boat will want to speed up, so make sure there is enough water in front of the boat to get the job done. In very strong winds it’s much easier to reef on shore or in a protected cove where the wind is lighter. Also, if you are just launching and it looks pretty windy out there, consider reefing before heading out. It’s quite a bit easier to “shake out” (untie) a reef, than it is to reef down. Shaking out a reef should be done with the bow pointing into the wind, since it’s just a matter of pulling on the tag end of the quick release knots and then quickly raising the halyard. Raising the halyard is always easier when the boat is into the wind. Tip #9. Always raise and lower the mast as quickly as possible while pointing the bow directly into the wind. 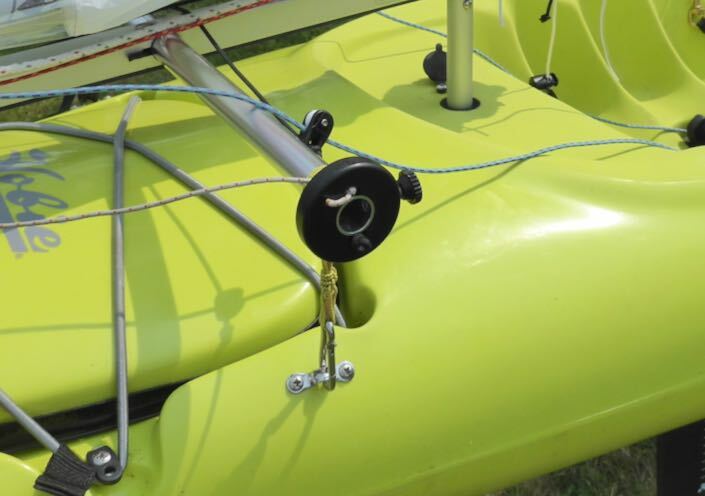 Quickly raising or lowering the mast while pointing directly into the wind is important to prevent mast track stress. The shrouds and forestay support the mast when it is in the full upright position, but when the mast is halfway up or halfway down, it is unsupported except for the minimal support provided by the mast car and track. This halfway zone is the most vulnerable position for the mast track. Pointing directly into the wind and acting quickly will keep the track in good shape. Tip #10. Keep the mainsheet on your lap at all times. Paddle-sailing requires that the mainsheet be cleated so one’s hands can be on the paddle. If a strong wind gust hits, and the main needs to be eased to prevent capsize, having immediate access to the sheet is critical. One’s lap is a pretty good place to keep the sheets. That said, when it’s really windy and one is paddle-sailing to windward, it can be helpful to hold the main sheet between one’s hand and the paddle shaft. This way that fraction of a second needed to grab the sheet from one’s lap will be eliminated allowing for a more rapid response. Windward paddle-sailing in strong gusty conditions can be tricky since the mainsail is normally tightly sheeted in, and this puts the kayak at greatest risk for excessive heeling and capsizing. So it’s smart to have the mainsheet ready at hand. Tip #11. In strong winds, pull in the main sheet prior to tacking. This can prevent the mainsheet from getting wrapped in the goalposts. Most of the time the main sail will already be sheeted in prior to coming about since it is likely that the boat will already be on a close reach as one initiates the tack. But situations may occur when one paddles into the wind from a beam or broad reach and the sheet is loose. This makes it possible for a hard wind gust to blow the sheet back around the goalposts. If this happens, don’t worry, simply uncleat the sheet and release the wrap with your paddle blade. But it’s better to avoid the situation altogether by simply sheeting in prior to tacking. Tip #12. Backwinding the genoa will help speed up your tack. In other words, when coming about, or “tacking,” if one waits to release the genoa sheet from the cleat until the mainsail fills with wind from the other side, the now backwinded genoa will help drive the bow away from the wind and onto the new tack. It can be helpful to listen for the main’s battens “pop” to the other side and use it as an audible cue to release the genoa and sheet it on to the new side. This is another maneuver that kayak-sailors share with catamaran sailors. Like many beach cats, kayaks lack the adequate inertia, as well as maneuvering ability to quickly pivot through a tack. Cat sailors frequently use a backwinded headsail to drive their boat onto the new tack. 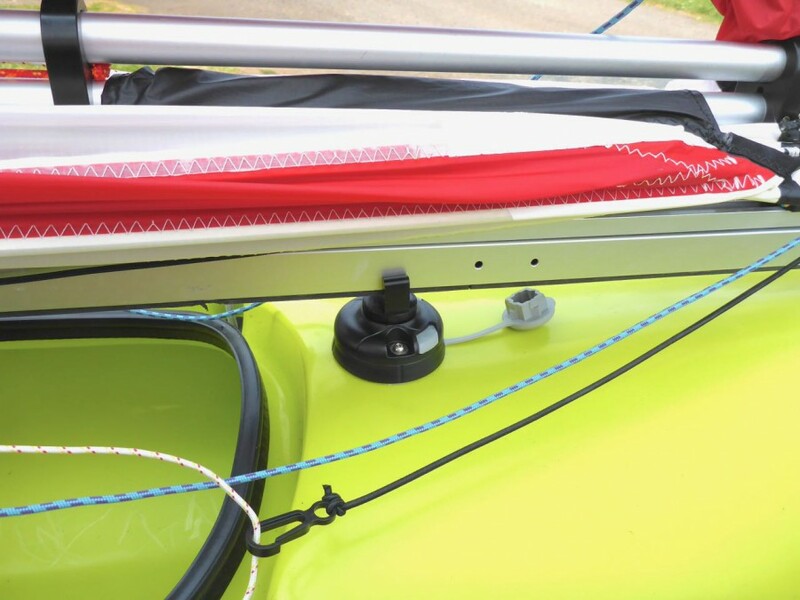 Another advantage of backwinding the genoa is that it helps to prevent the knot in the Kayaksailor’s genoa sheet from getting caught in the mast car. Tip #13. Try not to “choke the slot” with the genoa. So how do you know when your rig’s slot is choked? While it’s relatively easy to check the trim of the mainsail by observing the tell-tales and making sure they are flying together, it’s very difficult to see the genoa at all because the mainsail is blocking the view. If the boat feels like it’s going slower than it should, re-trimming the genoa might be all that is needed to open the slot and generate some speed. Try easing the genoa sheet until the genoa “luffs,” or flaps in the wind, then pull the sheet in just until the flapping stops. If you are not sure whether or not you sheeted it in too much, or if you change course, simply repeat the process by letting out and re-trimming. This technique works well in winds above five knots, but in very light air one may not be able to hear the sail luffing. In this case, simply grab the end of the boom and momentarily move the mainsail out of the way for a better view to see if the genoa is luffing. Tip #14. Insert the leeboard pushrod into the forward facing hole on the leeboard head. This will likely help with your paddle stroke. 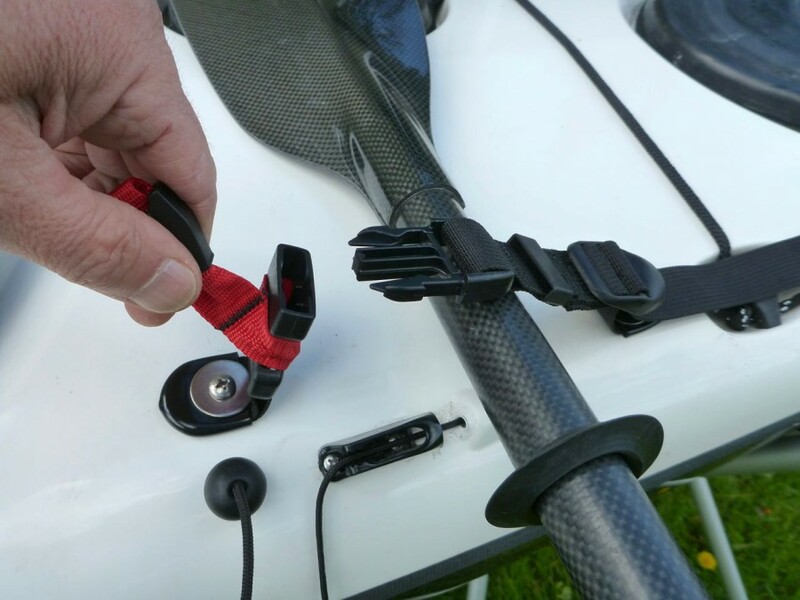 If you want to make more room under the boom for your paddle blade, simply insert the leeboard control rod into the forward end of the leeboard head. This allows the fiberglass leeboard rod to lay against the foredeck instead of sticking up in the air and getting in the way. Kayaksailor owners have been doing this for years, and it definitely allows for a cleaner paddle stroke. Here is an old blog post on the topic. Tip #15. Practice using a low angle paddle stroke. A less vertical, or “low angle,” paddle stroke works well with the Kayaksailor. The reason is that one is less likely to hit the leech (back edge) of the main sail with end of the paddle blade that is out of the water. Many paddle manufacturers make low angle paddles. These typically have slightly longer shafts and smaller, narrower blades. The narrow blades also make them easier to fit between the boom and the foredeck during the power stroke. We like using ultra-skinny Aleutian Island style paddles, but most low angle paddles will work well. 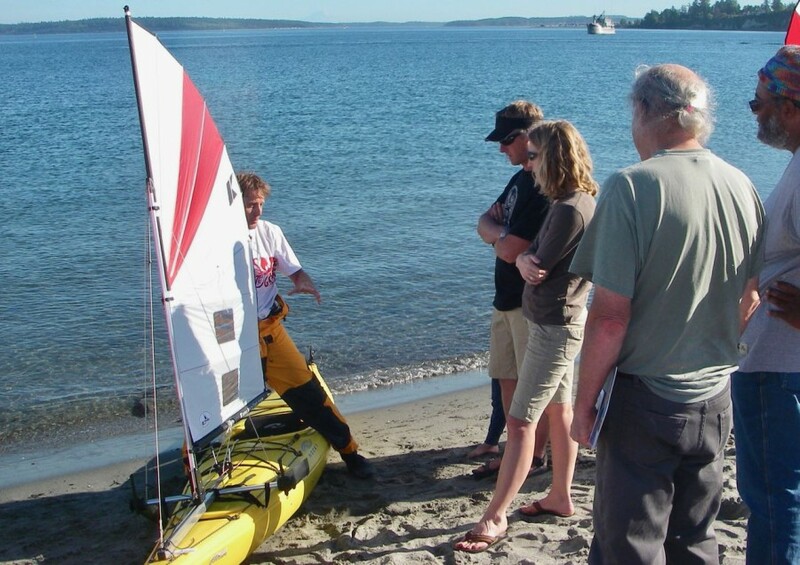 Hopefully these tips will help to improve your paddle-sailing skills. Fair winds and happy paddle-sailing! Hi Everyone! Below is a little video showing some fun kayak-sailing footage from Saint Joe Bay, Florida. 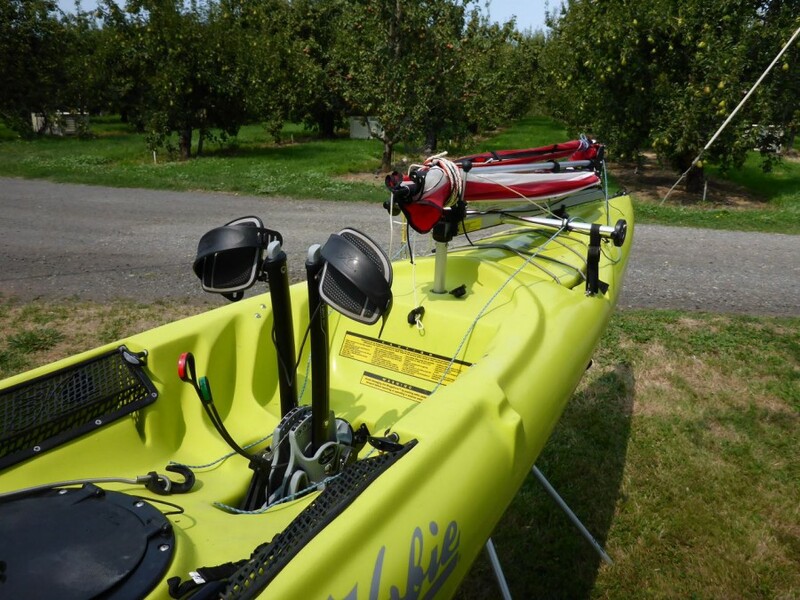 Our good friend Joel is seen here moving right along in his Ocean Kayak Prowler 13. Fast? Indeed! The sailing performance is impressive. It just goes to show how with the right rig, and in the right conditions, a relatively wide, roto-molded, plastic fishing kayak can cruise alongside a couple of composite sea kayaks. Normally on a paddling-only excursion, a boat like this would surely struggle to keep up. This is is just one of the many cool things about performance kayak-sailing. I left the clip unedited so that you could get a better look at the rig, and how nicely it works. If you look closely at the main, you can see the tell-tales flying perfectly together, indicating proper sail trim. The camera angle shows the ample draft in the sail which is responsible for generating much of the power. The foiled leeboards are both angled back to shed seagrass. Also notice how he rigged his leeboard pushrods. Inserting them into the leading edge allows the rods to stay close to the gunnels. And, at the end of the clip you can see the main sail tuned with substantial head twist to lower the sail’s center of effort and make the rig more forgiving and easier to control. On this day Patti, myself, and Joel sailed about eight miles in total, crossing the shallow, south end of Saint Joe bay. It was exceedingly fun with two extra long beam reaches! With a 12-18 knot south wind, the water remained protected by the peninsula’s lee shore and made for the perfect environment for some speedy paddle-sailing. 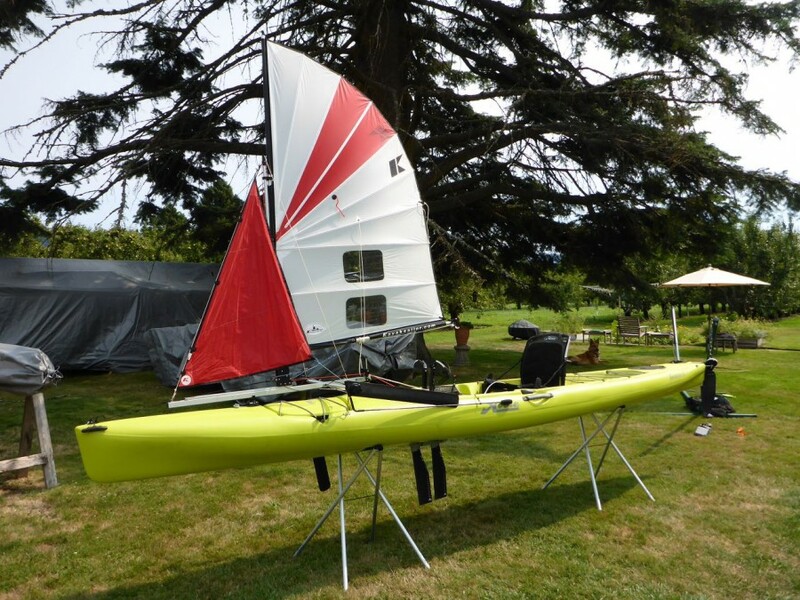 Joel’s rig is the all-white, polyester ripstop, Kayaksailor 1.6m² with genoa, mounted with the Railblaza, mounting kit. 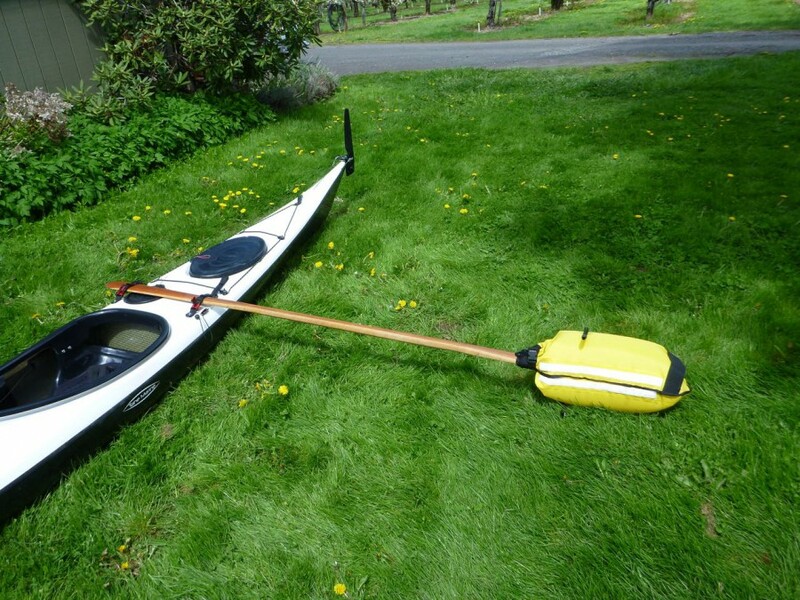 His boat is the Ocean Kayak Prowler 13. You can see Patti off in the background, sailing her 1.4m², reefed, with genoa. Patti’s boat is the Tahe Reval Mini LC. Of course you can’t see me because I’m filming while sailing my Tahe Ocean Spirit. It was a bit challenging trying to keep the camera still while sailing in and out of Joel’s wind shadow, but I loved every second of it! Have you ever capsized a kayak? If so, you know that reentering your boat is an important skill to master. In fact, it can save your life. Even while wearing a good drysuit, prolonged immersion in cold water will eventually lead to hypothermia; therefore reentry speed is important. In warm water, speed isn’t as critical, but most will agree that getting into their kayak quickly is a good thing. The problem for many is that reentering from the water isn’t the easiest skill to master. Young, lightweight people often seem able to hop into their boats with very little effort, while older, heavier kayakers can struggle with the reentry maneuver. So, what’s the answer? First, it’s important to understand the best way to reenter your specific kayak and practice this technique in a variety of sea conditions. Some kayaks are easier to get into than others. Remember that getting into your kayak on a warm summer’s day when the water is flat calm is one thing, but doing so on a cold, windy autumn day, in adverse sea conditions, is something altogether different. Secondly, it’s helpful to use any tools available to speed up the reentry procedure. Three of these include paddle floats, paddle float rescue straps, and the reentry stirrup. These tools can be especially useful in cases of injury or pain. Shoulder pain is all too common among avid kayakers and any device utilized to help get back into one’s boat is a valuable one. Different style boats often require different reentry techniques. Sit-on-tops and inflatables are typically very stable craft and not prone to capsizing. So it shouldn’t come as a surprise to learn that many owners have never contemplated how, or even if, they can get back into their boats from the water. The most common reentry procedure for sit-on-tops and inflatables involves flipping the boat to the upright position, reaching across the middle of the boat, grabbing the gunwale or carry handle on the far side, tilting the kayak up, and doing a scissor kick with one’s legs while simultaneously pulling oneself up and onto the boat. One usually ends up on one’s belly in the cockpit and then turns over in order to sit in the seat. While most kayakers, with a little practice, can perform this sit-on-top reentry procedure relatively quickly, many people, especially those of us who are older, overweight, or lacking in arm or leg strength, find this maneuver exceedingly difficult, even unmanageable. One solution is to use a rescue stirrup, with or without a paddle float. A rescue stirrup is a simple adjustable piece of webbing or line, with a clip (or other method of attachment) on one end, and makes a loop, or “stirrup”, for your foot. It’s simple to use. Just attach it to the middle of the boat near the cockpit, and while in the water, insert your foot in the stirrup, and step up to help lift yourself into the boat. The stirrup is used in place of the scissor kick and it can make it much easier to get on board. 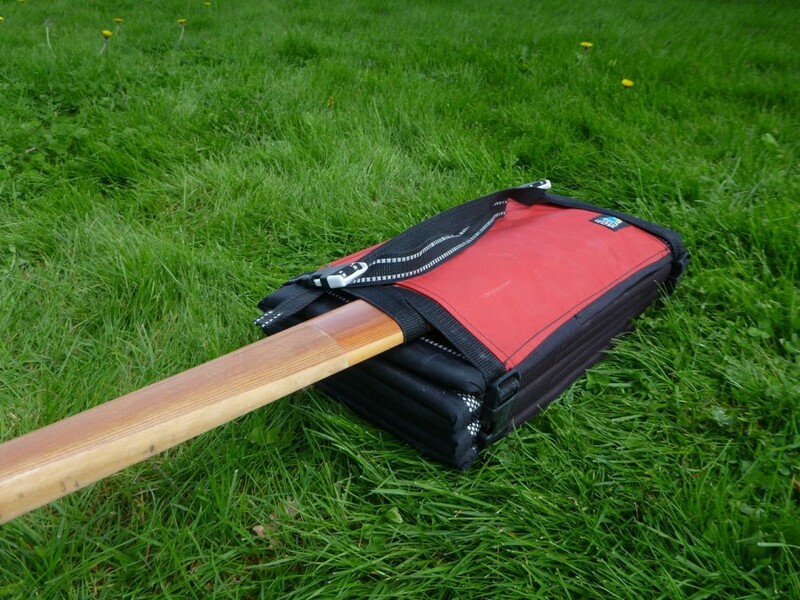 For sit-on-tops, the carry handles commonly located on the gunwales make convenient attachment points. 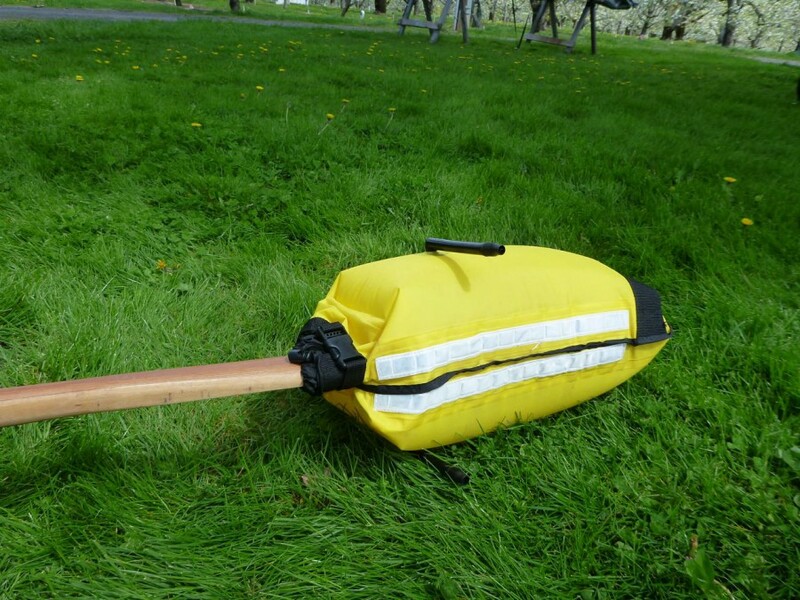 The paddle float is another self-rescue device. It’s basically a flotation device (either inflatable or made of foam) designed to attach to one end of the paddle. 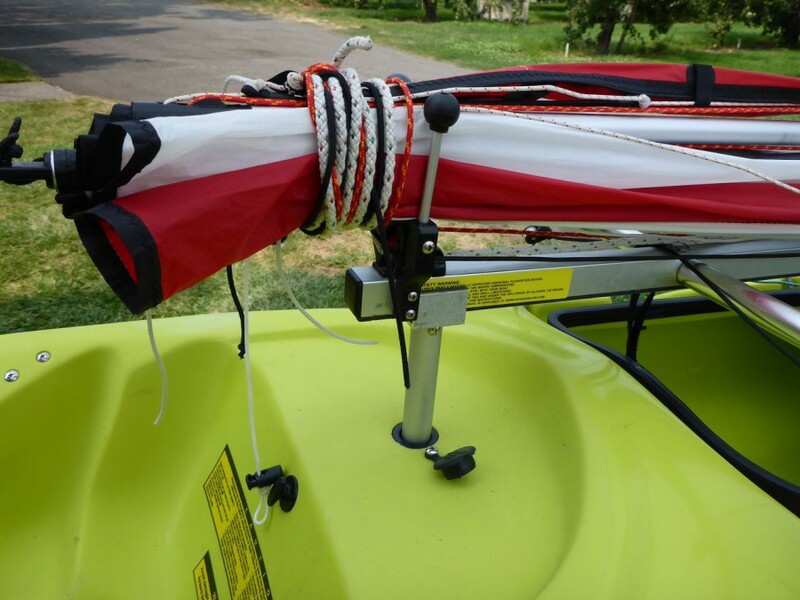 The other end of the paddle can then be temporarily attached to the kayak with a rescue strap, resulting in something like an outrigger to stabilize the kayak during reentry. 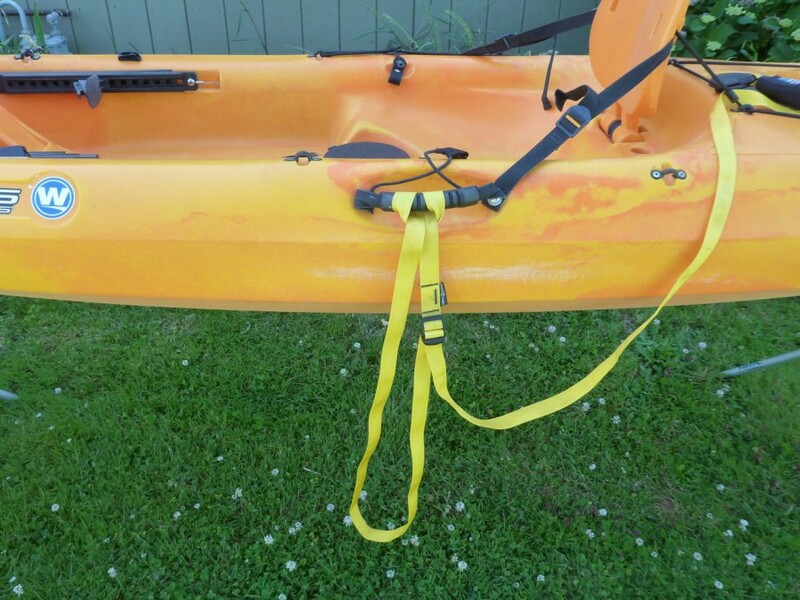 Paddle floats are standard equipment on narrow “tippy” sea kayaks, but can also be used effectively on more stable craft like recreational sit-on-tops, folders, and inflatables. Rescue straps hold the paddle securely in position behind the cockpit, allowing for one of the most stable methods of paddle float reentry. 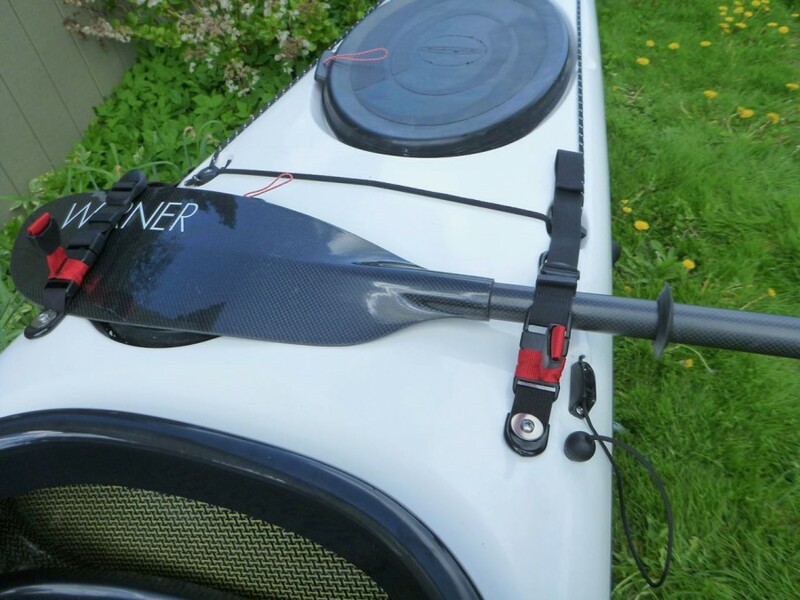 The straps can be easily adjusted to accept different width paddle blades. And, cleverly release to free the paddle. There are several excellent techniques for doing a paddle float reentry without securing the paddle to the boat (see YouTube), but in my mind the best and easiest method employs securing the paddle with a locking device such as the rescue strap. 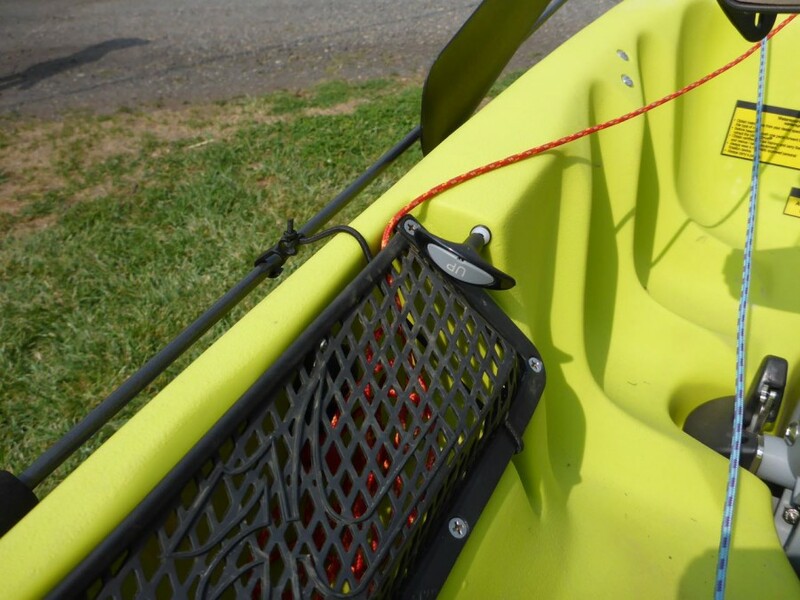 Bungee cords commonly found on the aft decks of most sea kayaks are often used to help hold the the paddle during a paddle-float reentry but they are not very secure and allow the paddle to easily move out of position. 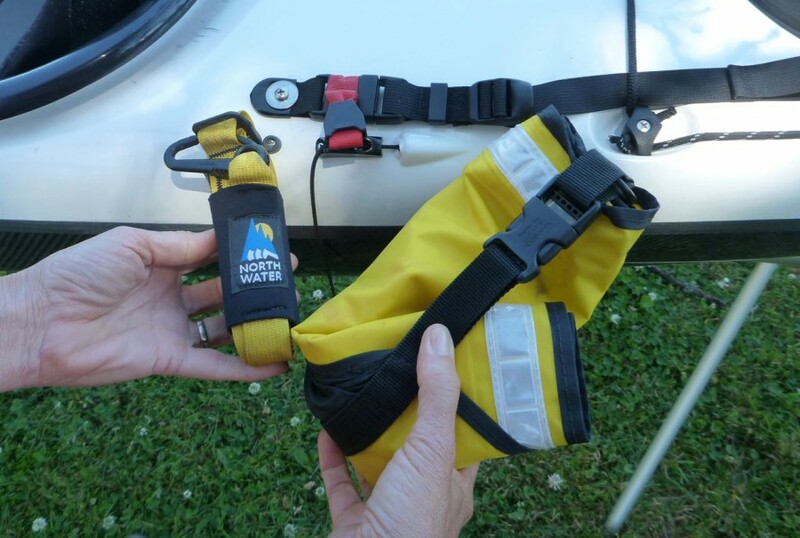 Paddle float rescue straps are easy to use, hold the paddle to the boat securely and allow the use of both hands to be used during reentry. Now let’s consider recreational sit-inside kayaks. While sit-on-tops and inflatables are some of the easiest kayaks to reenter, recreational sit-inside kayaks, especially tandems with their large cockpits, can be quite challenging to do a self rescue with. Because of their big open cockpits and minimal, sometimes absent, bulkheads, these boats can take on a ton of water during a capsize. The result is that once righted they sit very low in the water. Intuitively, this might seem like a good thing as one would think they would not have as far to go to get into the boat. But the reality is that a swamped kayak settled low in the water is very unstable and can be frustratingly difficult to maintain upright. This is perhaps one reason why sit-on-tops have gained so much in popularity in recent years. 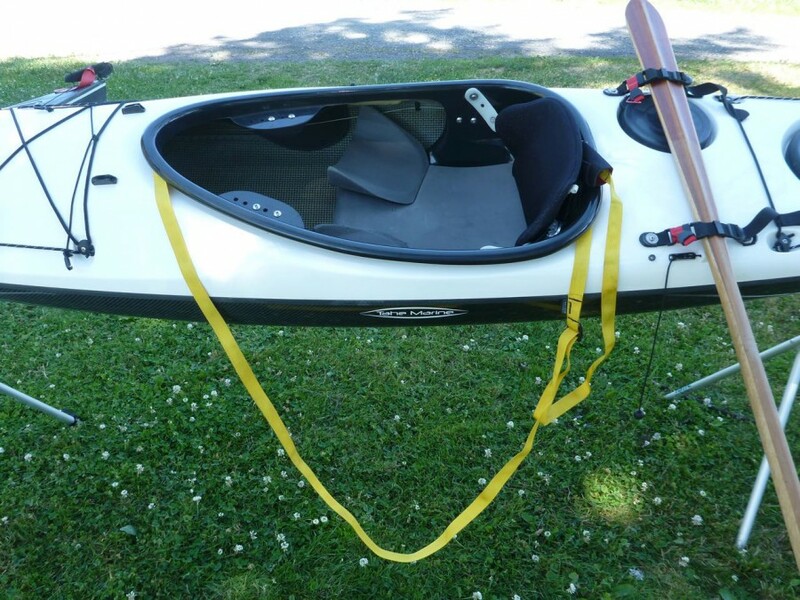 Using a paddle float with a pair of rescue straps is a great way to reenter and self-rescue a large cockpit, recreational, sit-inside kayak. Not only will the outrigger technique stabilize the craft, but it will allow the cockpit to remain relatively level while bailing out all that water. Bailing wide, large cockpit boats is normally done with a hand pump, a hand bailer, or a small bucket. Hand bailers can move allot of water quickly. Consider experimenting with different bailing devices and use whatever works best. It’s always a good idea to keep multiple bailing devices on board, and remember, leash them to the boat! They won’t work if they’ve floated away. 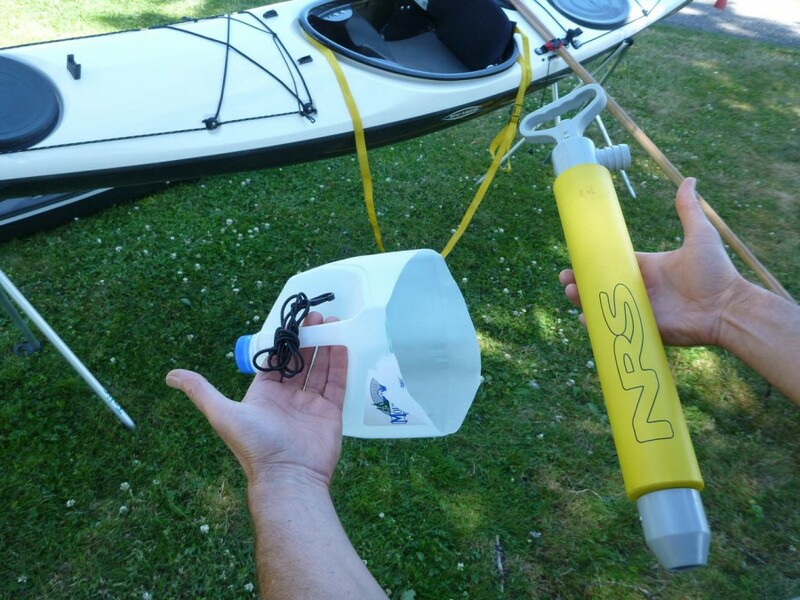 For reentering a narrow touring kayak such as a sea kayak, paddle floats, rescue straps, and rescue stirrups can all be extremely useful. As mentioned, paddle floats are standard safety equipment for sea kayaks (also known as touring kayaks). While most sea kayak purists advocate mastering at least one roll recovery technique (think Eskimo roll), the fact is that most people who own sea kayaks are not able to execute a reliable roll. In my opinion, all owners of touring style kayaks should seriously consider having reentry devices on board. 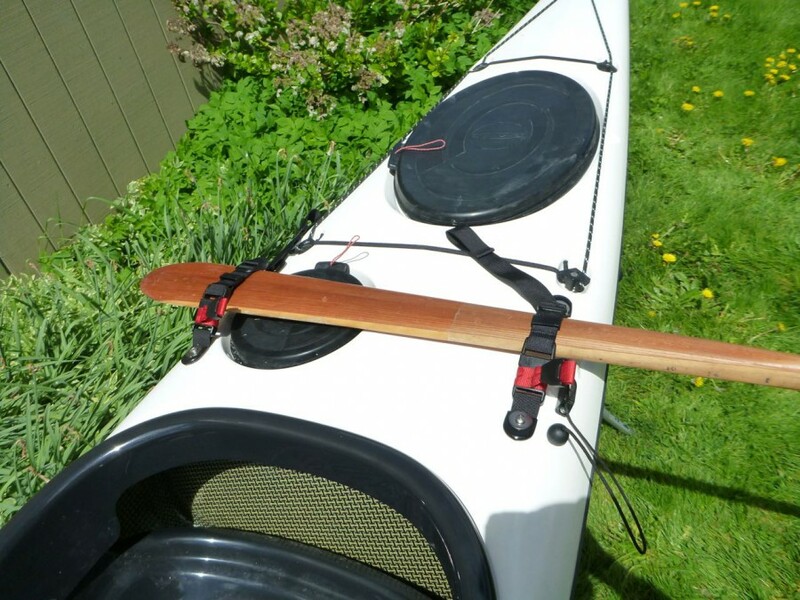 At a minimum, a paddle float and a pair of rescue straps. Even with a reliable roll down, exiting the cockpit is always a possibility. And, this is especially true for kayak-sailing where it’s the norm to exit the cockpit in the event of a capsize. Most reputable sea-kayak tour operators require that self-rescue reentry devices be carried on board their kayaks, and we would all be wise to do the same. So, whether you are an accomplished kayaker or a novice, have a performance high-end boat or a Walmart special, being able to reenter your boat from the water is paramount for safety. We should all know the best reentry technique for our specific craft, practice it often, in a variety of conditions, and use any reentry tools necessary to get the job done quickly. I hope this post proves to be informative. Please feel free to leave a comment. Just want to share with you this little video collage put together from our library of clips. As you probably already know by now, Patti and I routinely bring our cameras along with us when we head out on the water, and while it’s always super-fun to sail together and capture the moment, it’s even more fun to review the footage later and relive those special moments. We hope you enjoy watching it! Let’s go sailing!